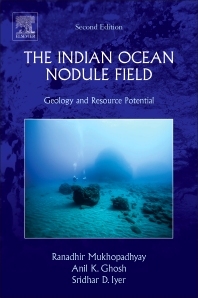 The Indian Ocean Nodule Field: Geology and Resource Potential, Second Edition, provides a view of the most recent studies along with classical theories starting from the 1960s. New concepts, hypotheses and critical appreciation of the state-of-the-art knowledge on nodule formation and resource management are featured in this new edition. The economy of the Indian Ocean has vast potential and yet it is one of the least studied oceans. Garnering economic advantage out of mineral resources from deep oceans has been a long cherished dream for the mining community. The availability of 5-metal rich polymetallic (manganese) nodules in specific areas of the Indian Ocean has lured researchers to discover more about their processes of formation, growth, distribution and enrichment. Anil K. Ghosh, Professor-emeritus, is an eminent academician in the field of mineral resources at University of Calcutta. He has guided many doctoral and post-doctoral projects, and published about fifty research papers in SCI journals. He has researched on Indian and Pacific Ocean nodules in great details utilizing close collaboration with other institutions. He is a co-author of the Elsevier's book on Indian Ocean nodules, and is the senior author of another book on underwater minerals. Prof Ghosh has also edited a book on land based resources, and was the guest-editor of a special volume of a reputed journal. Recently, he has taken the pioneering initiative to declare ‘charnockite’ as the National Rock of India. Sridhar D Iyer has investigated the volcanics and morphotectonics of the mid-ocean ridges and seamounts. The study provided better understanding about the geomorphology of the Central Indian Ocean Basin (CIOB) and the characteristics and origin of the volcanics and their relationship with the ferromanganese deposits. He is presently working on the challenging aspects of coastal mineral resources. He has received the Council of Scientific & Industrial Research’s (New Delhi, India) Young Scientist Award (1994) and the CSIR Raman Research Fellowship (1996). He has more than 70 publications in peer-reviewed and reputed journals and has also co-authored a book on the ferromanganese deposits of the CIOB. Sridhar D Iyer has a doctoral degree in Marine Geology and is a Professor and Chief Scientist with CSIR- National Institute of Oceanography, Goa India. He has 35 years of research experience in Marine Geology and his fields of interest are deep sea geomorphology, structures, volcanism and resources especially polymetallic nodules and hydrothermal minerals. In the last decade and half he has carried out investigations related to the Indian coasts with emphasis on coastal geology, petrology and placer minerals. He has participated in a number of oceanographic expeditions and enjoys carrying out coastal field works. Several students and project assistants were guided and mentored by him for their Master’s dissertations and doctoral thesis. He has co-authored 2 books, published more than 80 research papers and is a reviewer for several journals. He was India’s corresponding member for InterRidge and was a recipient of the CSIR-Young Scientist award and Raman Research Fellowship.